The Maker’s Diet is based on Biblical principles, and addresses not only nutrition, but focuses on the four pillars of health; physical, spiritual, mental, and emotional. 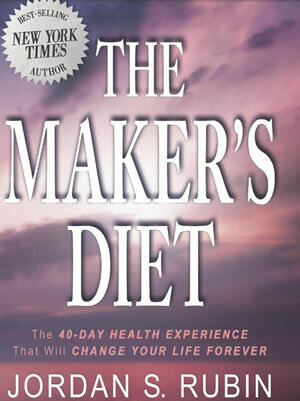 The Makers Diet was written by Jordan Rubin – who suffered considerable health problems (Crohns disease). He was able to reverse the symptoms by incorporating a whole foods diet regimen – and a faith in the Maker Himself. The nutritional aspect of the diet is based on ancient Jewish dietary laws. Pork and bacon are to be avoided, as are fish without fins or scales (i.e. shellfish). Food in it’s most pure and natural form is to be eaten. There are also a considerable list of ‘required’ supplements on the list. The Makers Diet is a holistic 40 day program that encompasses many aspects – not just healthy eating. The daily regimens include prayer and exercise, as well as meal plans. Eliminate your consumption of processed foods and chemicals in Phase 1. This will likely cause a reaction similar to detoxification, but this is expected and healthy. INCREASE YOUR WATER INTAKE AND REST AS OFTEN AS YOUR BODY NEEDS. Remember that if you stray, you’re always only one meal away from regaining success. MINIMIZE OPPORTUNITIES FOR FAILURE BY AVOIDING SITUATIONS WHERE YOU CANNOT FOLLOW THE DIET. DON’T EAT WHEN YOU’RE ANGRY, SAD, SCARED or ANXIOUS. These emotions shut down digestion and depress your immune system. GET OUT IN THE SUN. Exposure to sunlight is very beneficial to your health, and can aid in balancing hormones, enhancing mood and building strong bones. There appears to be no scientific basis for some of the medical claims of the diet. However a diet richer in unprocessed foods is certain to have some benefits. The Maker’s Diet also has a line of supplements – under the brand name “Garden of Life”. Beware of these – in 2004 the FDA ordered the company to “stop making unsubstantiated claims for it’s products” (reference). Author Jordan Rubin’s credentials have also been questioned. However despite this there are many positive comments from adherents to the diet. Jordan Rubin also has a new line of foods called Beyond Organic. They are marketed as, “NO Pesticides, NO chemical fertilizers, NO hormones, NO antibiotics, NO GMOs, NO grain, NO high heat processing, NO industrial shortcuts, NO milk pooled from hundreds of farms, NO fat skimmed, NO synthetic nutrients, and food from animals that are treated humanely”. At this point they mainly look like some meat, dairy, oil, and spring water products. The Maker’s Diet by Jordan Rubin retails for $14.39 on Amazon. The additional cost of supplements will add to the costs if you do the diet exactly as directed. This sounds more like a fight than a recommendation. The truth of the matter is when speaking about the diet in the Bible, it is this way. In the garden of Eden, Adam and Even were given fruit, grains, and nuts. Vegetables were added after sin and after they were thrown out of the garden. Meat was added after the flood for three reasons. There was not much plant food available, man did not have enough faith in God for Him to provide food for them, and God allowed them to eat meat to Shorten their life span. Most vegetarians who eat a balanced diet live longer lives than meat eaters. This is of course an average, there is always exceptions. Vitamin B-12 is not present in vegetable foods, but is in dairy foods and yeast. A vegan diet is a good diet if followed closely scientifically, but one that is eaten in an unorgainized way and the protein content is not observed, and B-12 supplementation is not taken, it is not healthy. Saying that, I will add that as you know, our food is not as healthy as it was even 200 years ago. Chemicals in our ground, water and air have influenced our health through our food and to us directly. May vegans I have known, though they try to follow a careful diet, eventually develop allergies to most grains, diary, other foods (according to the individual). You have to know what you are doing. To be honest, one can find a “study” to prove anything they want. In my opinion it is best to eat as close to the original diet as possible. If you choose to eat meat, it should be kosher. “Unclean” animals were classified in the Bible as unclean because they are scavengers, and if you are what you eat, so are they. The allowable food list is found in Leviticus. This diet is great! I have the read the book twice now.. just trying to save it all to memory. I have been struggling with anxiety and depression for two years now. I just had no energy and felt horrible! I’ve been on Lexapro for two years and after having several skipped heart beats, I decided to try something different. After reading the book, I started on the vitamins and minerals, fish oil and eating healthy. After just two weeks, my energy level is up and I feel great!!!! I am now down to 2.5mg of my Lexapro and am so excited about being able to wean off it for good!! The Maker’s Diet has been a God send for me! Even if meat wasn’t part of the original diet it is still exceptable to eat considering it was add on after the flood. With crohn’s or colitis it would be dumb to refuse meat because of the iron in it. If you are iron insufficient you would be killing yourself to be a vegetarian. I was Diagnosed with Ulcerative Colitis (basically chrons but ONLY in the Colon)I dropped Pork, and started eating as close to the maker’s diet as my budget will allow. I am now not worried about where the bathroom is and how far away I can get before… OOPS. I am not cured but God’s timing is always Perfect! Thanks Dr. Rubin for giving me the keys to my life again, and thank you JESUS for sending Dr. Rubin my way! The original Diet for man and beast was a vegetarian diet(Genesis 1:29-30- And God said, Behold, I have given you every herb bearing seed, which [is] upon the face of all the earth, and every tree, in the which [is] the fruit of a tree yielding seed; to you it shall be for meat. :30- And to every beast of the earth, and to every fowl of the air, and to every thing that creepeth upon the earth, wherein [there is] life, [I have given] every green herb for meat: and it was so). God also intends for us to be restored to that original diet before he returns. (Acts 3:19-21- Repent ye therefore, and be converted, that your sins may be blotted out, when the times of refreshing shall come from the presence of the Lord; :20- And he shall send Jesus Christ, which before was preached unto you: :21- Whom the heaven must receive until the times of restitution of all things, which God hath spoken by the mouth of all his holy prophets since the world began. Also; Isaiah 11:7- And the cow and the bear shall feed; their young ones shall lie down together: and the lion shall eat straw like the ox. I HAVE THE BOOK. I SARTED READING IT, ALTHOUGH I’M NOT HALF WAY THROUGH IT, I JUST BELIEVE IN NATURAL CURES,AND I DO TAKE PROBIOTICS. I ALSO WAS DIAGNOISED WITH ACID REFLUX,AND WAS PUT ON THE PILL PRILOSEC,WICH TO ME DOES NOT WORK FOR ME, AND I ALSO HAD A STOMACHE INFECTION WICH MADE THE ACID REFLUX WORSE, WICH MADE ME FEEL WORSE,SO I’M GOING TO TRY THE MAKERS DIET AND I WILL LET YOU KNOW HOW I FEEL AFTER THE DIET. We followed “The Makers Diet” per Dr. Mercola after our son was injured after receiving his 22 mos. M.M.R vaccination. Shortly after this M.M.R he developed leaky gut which is prone to colitis or crohn’s disease. Our son was 4 yrs old at the time and had suffered severe stomach pain, nausea and also lost so much weight due to the M.M.R vaccine. We followed the diet for 2 years and he now is healed from the leaky gut. Our son is now 10 yrs old and is a healthy almost stocky built young boy. He rarely ever gets sick when others around him have viruses and flu’s. As a family we still today follow some of these old principals in our daily diets as probiotics, Cod liver oil, coconut oil and eat only organic fruits and veggies. It may cost more for groceries but it pays off as our Son has not seen a medical doctor since he was 22 mos. THANK GOD FOR THE MAKERS DIET! I started on this diet 3 years ago because I was desparate to find a cure to my chronic ulcerative colitis. I had been on high-dose steroids and hospitalized many times to get it under control. My condition became very grave and we were afraid I was not going to make it another year. Amazingly, within a few weeks of changing to the Maker’s Diet my symptoms all but diappeared. I have enjoyed 3 solid years of remission from the colitis symptoms. Praise God for His goodness and kind instruction! Frankly, I think that while interesting this debate is rather old, and anyone that has thoroughly studied the bible (for example, in a basic college course) is likely to have formed their own opinions regardless of what anyone else says to them. Now on to the diet….I have had a severe digestive disorder for 2 years now that is has general symptoms of IBS, but bouts of extreme weight loss, bowel issues, inability to eat, and occasionally bleeding and vomiting. It’s horrible and has yet gone improperly diagnosed but I believe that it is the beginnings of chrones or colitis due to both my ancestry and extreme symptoms. I’m pretty much done with doctors as they tell me the same things over and over and I now have sooo many medical bills and no diagnosis. What I CAN tell you however, is that all of my symptoms get better with a very similar diet including: No fried foods, No cow’s milk dairy, no yeast, nothing processed and very little sugar. Based on these things I think regardless of your spirituality or lack thereof, this diet is right on course. To “remain nameless”, your quote is erroneous, “everything created by God is good, and nothing is to be rejected” IF IT IS SANCTIFIED BY THE WORD OF GOD AND PRAYER. The problem is that this is MISQUOTED so often by those “whose God is there belly and their damnation just” (Paul to the Romans). Peters vision was not an authorization to eat that which was common or unclean, but rather an admonition for him to stop treating gentiles like they were pigs. That which had been made clean were not pigs (as anyone who has seen one can see) but rather that gentiles had been cleansed at the cross. The laws of health never changed. Strange that he should call it the makers diet and yet include meat. My Bible says in Genesis that the original diet didn’t include meat. He avoids Pork and shell fish which is correct according to Genesis, Exodus, and the last chapter of Isaiah, but misses the fact that unless the blood is properly drained from the animal and the fat carefully removed, even beef is considered unclean (kosher slaughter follows strict rules). I don’t doubt the success stories of a few, but more would benefit if they followed the plan more closely than this half way attempt. The Maker’s Diet is not a vegetarian diet. Dr Rubin recommends that you eat healthy meats. Know what you are talking about before you try to criticize something. I must disagree with some of the statements from Anonymous. I am a vegan and know of others who don’t eat meat who also have strong faith. I believe more strongly in religion than some of my close family members who eat meat! However, I don’t think that people have to be a vegetarian, and that someone can live a healthy life in other ways as long as it is a balanced diet with a focus on food that is processed as little as possible and hopefully organic as can be! SOME people could die on a vegetarian diet IF it was unbalanced in some way or they were ingesting toxins somehow. There is so much research out there and I know of MANY vegetarians who are healthier than the average person. It truly is about balance and wisdom. Too bad some of your vegetarian friends died, but maybe they were going about it the wrong way and/or had other factors that caused their demise! Personally I can say that since becoming vegetarian/vegan I have more energy, am usually healthy and can think clearly, AND am more in tune with spiritual things. Just to show there is a way to be a vegetarian, healthier, and strong in the faith! The Bible clearly states that those who only eat vegetables are of weeker faith, but that we should not judge them for that. It is very sad when those who claim the vegetarian way as the only way when there are many people who would die on that sort of diet…and yes, I do have proof of that. This diet makes perfect sense to those who read the whole book, and have a religious background… it is just a call to bring you back to the basics of eating.